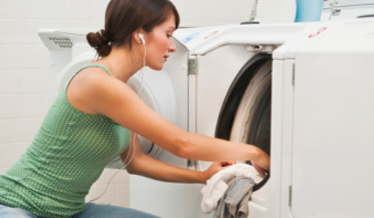 There’s a reason it’s called housework—you can burn serious calories! Find out how to take your to-do list to another level with these simple tricks. 1. Plan your chores like a circuit workout. Pop on some headphones with your favorite music playing then toss laundry in the washer, head to living room to dust, go to the garage to sort your recycling, and then circle back to put clothes into the dryer. 2. Get out in the yard! Feeling spring all around you is a huge motivator. Weeding melts 250 calories an hour and works your arms, legs and back muscles. Using a push mower drops 325 calories in the same time. 3. Organize your stuff. Instead of balancing boxes, baskets or buckets on your hips, carry things in your hands, with your arms stretched out. The farther away you can hold an object, the more you’ll work those arms. 4. Make dinner. Believe it or not, cooking can give you a workout. Chopping, kneading, stirring, and the inevitable cleanup will lead you to burn 150 calories an hour. Over a month, it adds up. 5. Mop the kitchen floor. This doesn’t sound like fun in and of itself. But mopping while taking in the scent of a calming summer breeze? Much better! Wash your clothes (including your favorite housework tees and sweats) with a liquid detergent; then breathe in the intoxicating essence of good energy while you clean the floor. That’ll rack up 240 calories an hour! Another great option to invigorate your senses: Use a delightfully-scented floor cleaner. 6. Sorting laundry is easy, but can you do it standing on one leg? Any time you have to fight to keep your balance, you work your core. That accounts for basically every muscle in your torso, abs included. Make it a Zen moment: Dryer sheets contain bursts of crisp citrus, a sweet green twist, and just enough floral fragrance to make chores seem like less of a chore. As long as you are moving you are burning more calories than you would be just sitting still. Farigie, thanks for stopping by and leaving us a comment!